How fun is this bright orange hallway?! 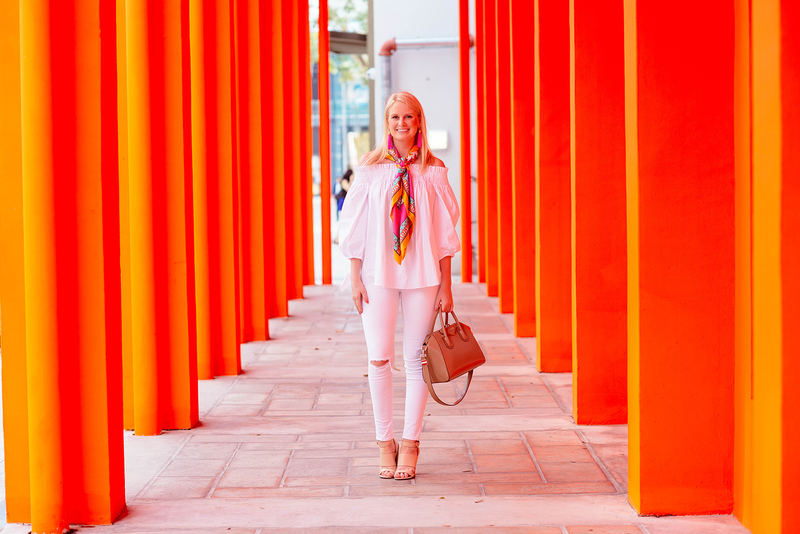 This spot can be found next to the Fendi store in the Miami Design District – we thought the shocking orange walls would be the perfect backdrop to shoot this clean all-white look. 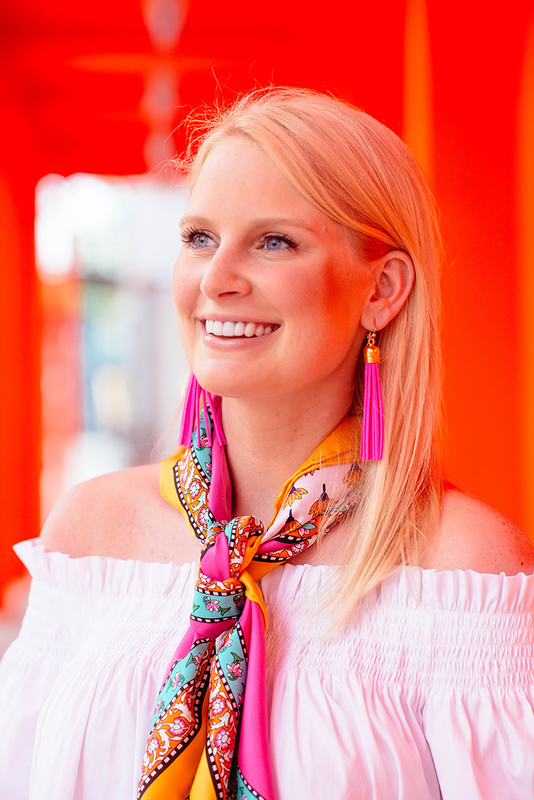 I love how it accentuates my colorful new scarf and earrings too! 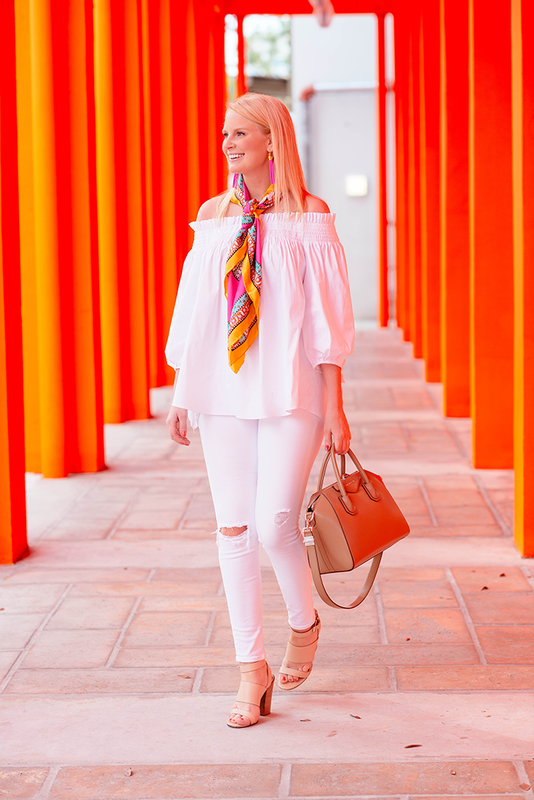 Scarves like this one are a great way to add a little color to your favorite neutral ensembles all season long. What’s even better is they can be styled SO many different ways. They can be wrapped around the handle of your go-to handbag, tied around your wrist, worn as a headband, or styled numerous ways around your neck. Next time I’m going to try styling it this way with a simple white tee for a more casual, cool vibe. I’ve had a couple requests for a video featuring ways to tie scarves like this – would you guys be interested in seeing something like that? I would love to hear what types of style videos you’d like to see from me! Feel free to email me or comment below with your thoughts/requests. 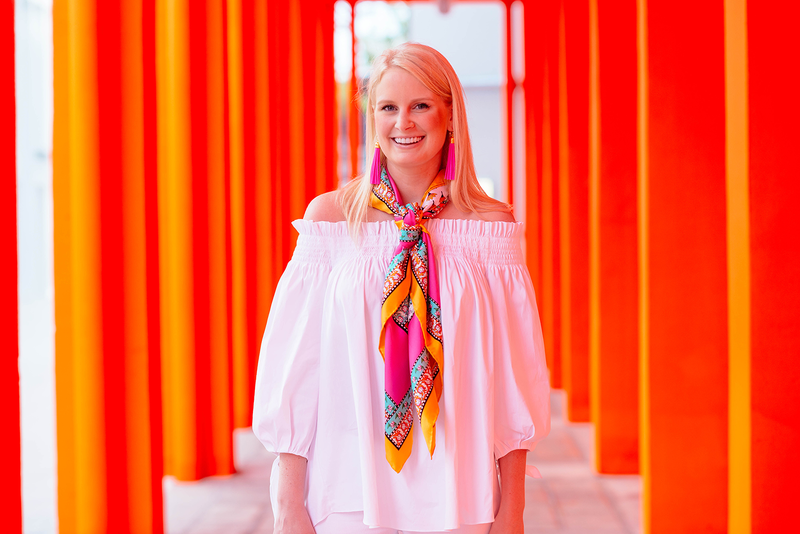 Be sure to subscribe to my YouTube channel to see my first two videos and get instant access to see my next one – my Miami travel diary! Stay tuned! PS – sadly this particular top is sold out, but I found a nearly identical one for under $100! This one is also adorable and only $50! You look absolutely fabulous girl! Loved this outfit on snapchat, this scarf is gorgeous. SO fun! Love the pops of pink! Pinning this look! 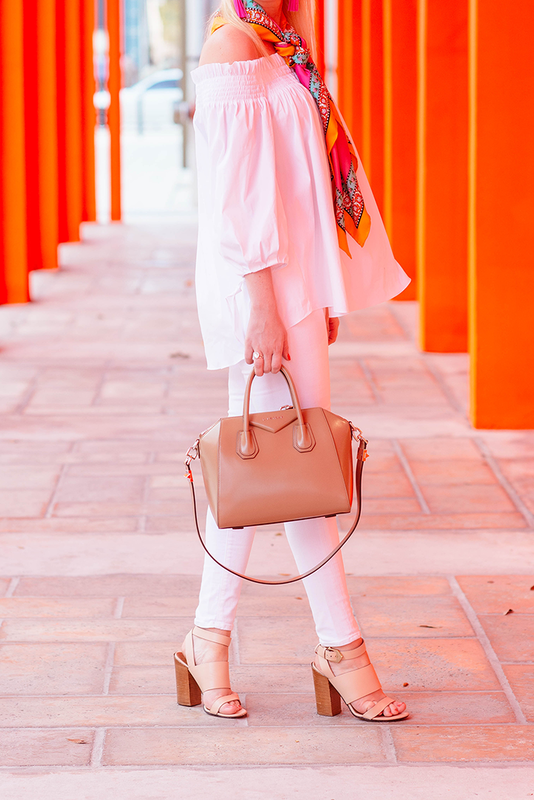 Love the all white with a pop of color! And these photos are amazing!! You have one of my favorite wardrobes! Love all white — and that MIami hallway is just perfect. I can’t get enough of your Miami photos! I LOVE how colorful all your Miami pics are! This scarf is amazing! 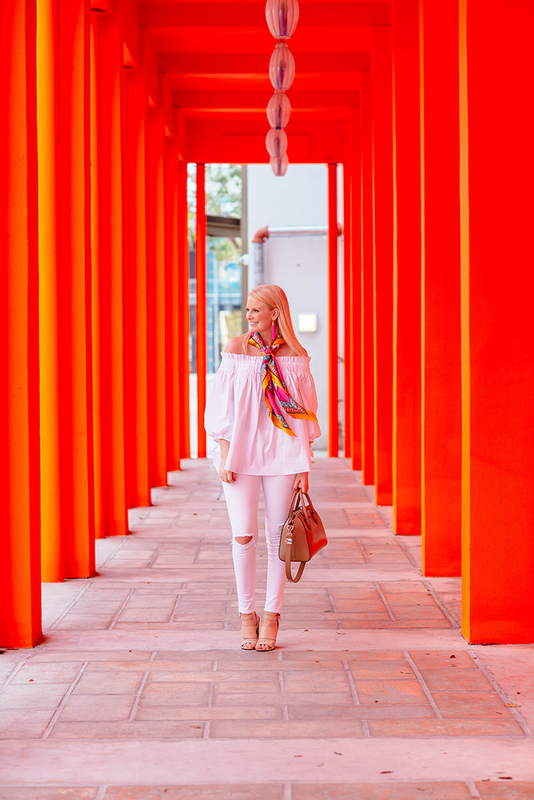 Your trip to Miami has been just the burst of color I need on my Instagram feed. What an awesome spot to shoot! You have reached a great color combo with white and orange in your photos. Everything in this post is dazzling! 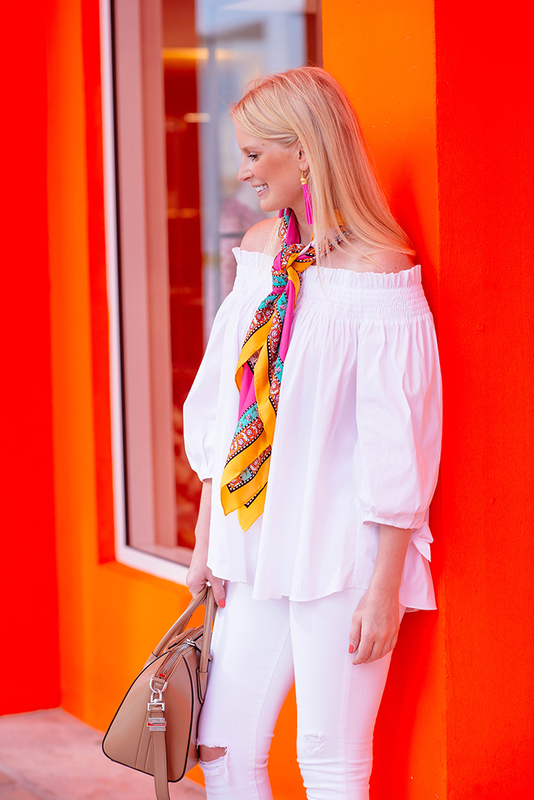 This is so pretty – I love the all white outfit, which really lets the colorful scarf shine! Such a great look! 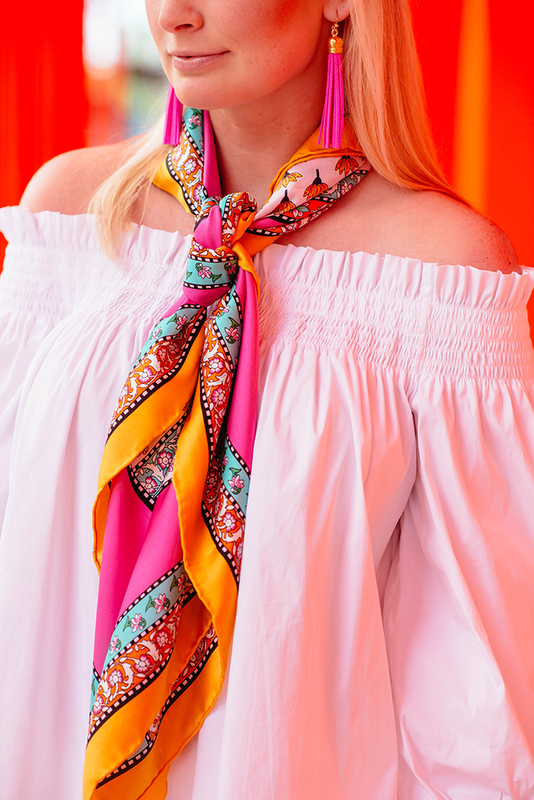 Love the pop of color on your scarf! What fun photos! Love this, Merritt.